Seven soon-to-be Wheaton graduates spoke recently with The Sun Chronicle about the jobs they’ve landed, graduate school plans they’ve made and how their education has prepared them for what’s next. The interviews are part of a package published May 4 that looks at the current job market for graduates (“bright”—according to experts quoted in one of the articles), as well as the myriad opportunities available to students and the ways programs such as those offered by Wheaton’s Filene Center for Academic Advising and Career Services help ready students for life after college. One article, titled “Working for a job: Seven students, a common theme,” highlights several of Wheaton’s most recent success stories, including Quinn Hurse ’18, an international relations major, who fielded not one but three job offers in the financial industry‚ ultimately choosing a position with Goldman Sachs in New York City (for whom she interned twice while at Wheaton). Also graduating with a job is Winston Stewart ’18, a double major in economics and business and management, who will be working in sales with recruiting agency Alku. Other students, such as neuroscience major Maria Matrango ‘18, have enrolled in graduate school. She will be pursuing a master’s degree in nursing at Simmons College this fall, with a focus on pediatrics, according to the article. Two other articles, all by reporter George W. Rhodes, check in with Filene Center Director and Wheaton alumna Lisa Gavigan ‘83, who talks about the role of the center and offers a few tips for job seekers. 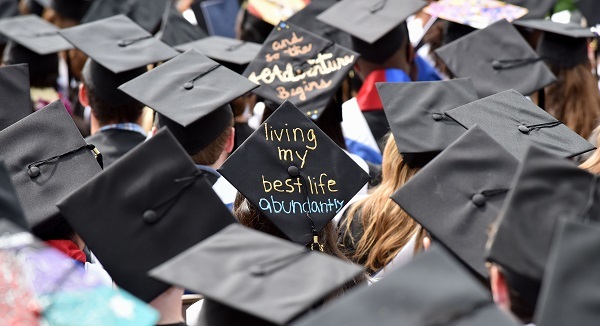 Wheaton’s 183rd Commencement will be held on Saturday, May 19.